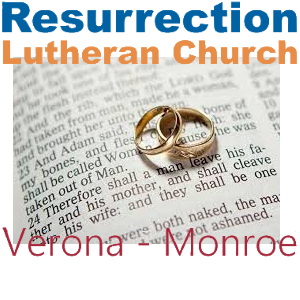 RLCNotes - Resurrection Lutheran Church Verona Wisconsin SPECIAL SERMON ON MARRIAGE OCTOBER 4 AND 7 and 8! SPECIAL SERMON ON MARRIAGE OCTOBER 4 AND 7 and 8! Marriage is a wonderful gift from God. Yet, we see marriage attacked on every side because of sin. Maybe you`d like to learn more about marriage. Maybe you have a friend or family member struggling in a marriage that isn`t going so well. How can God`s Word help? What is marriage in God`s sight? What blessings does God give in marriage? Services on October 4,7,8 will answer those questions from God`s Word. Hear for yourself. Invite a family member!